In 2010, The U.S. General Services Administration (GSA) set out a new proactive agenda to become more sustainable and to find innovative solutions to reduce costs for the American taxpayer. 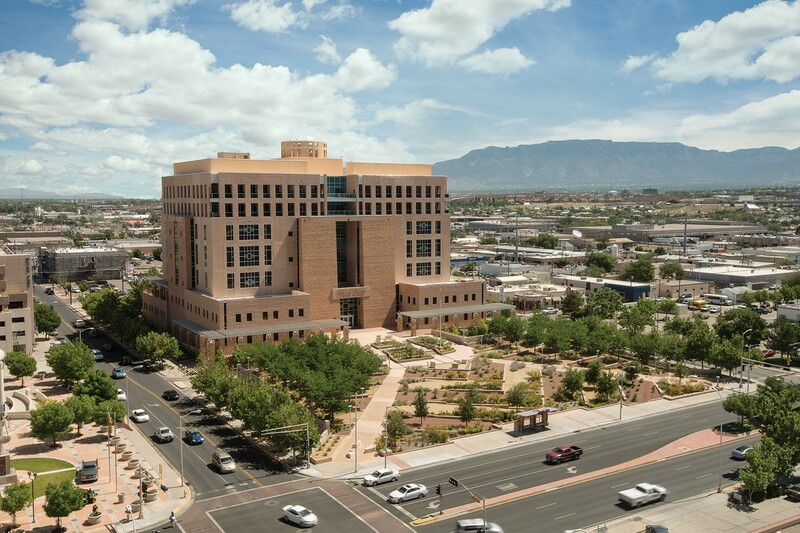 The courthouse landscape renovation of the Pete V. Domenici U.S. 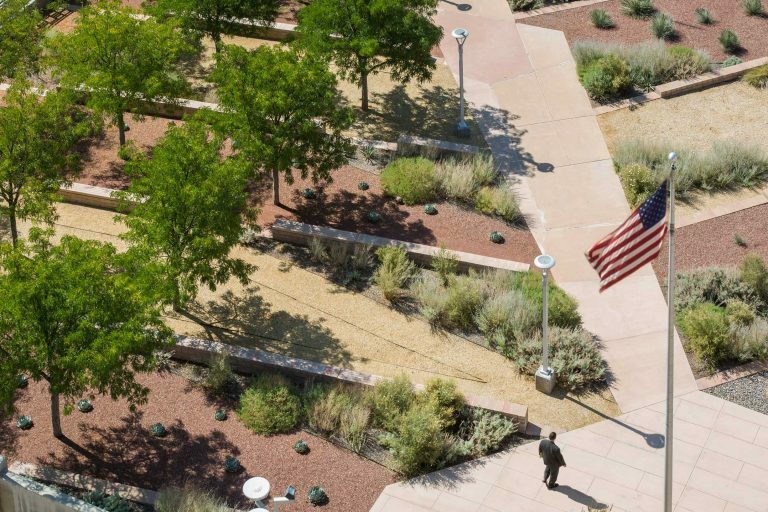 Courthouse, spanning 3.3 acres in downtown Albuquerque, New Mexico, was selected to be a pilot project for the Sustainable Sites Initiative™ (SITES) and more importantly provide the test case for the GSA to evaluate their ambitious sustainability goals. 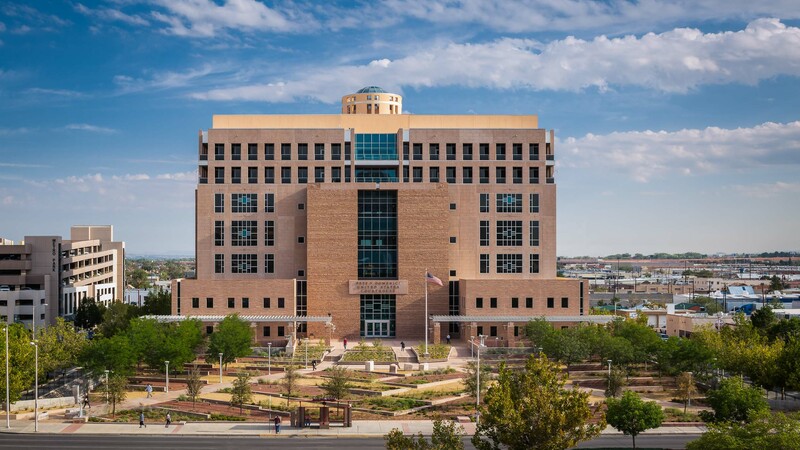 Originally built in 1998, this federal courthouse was constructed on the site of one of Albuquerque’s last downtown public parks. 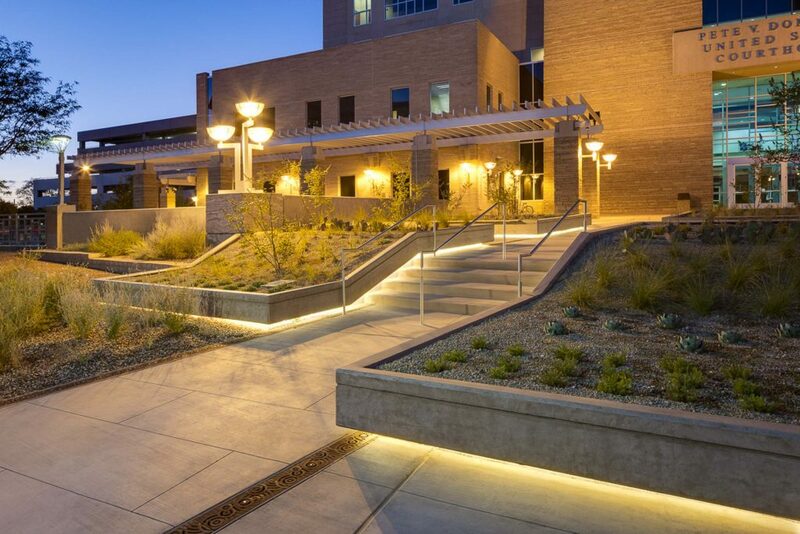 However the courthouse’s original site design quickly diminished in Albuquerque’s extreme climate, becoming inefficient, disconnected from its environment, and distanced from the public. Large, hot, paved plazas were completely empty throughout the day and the extensive, unused lawn areas required more than 3.5 million gallons of potable water each year. 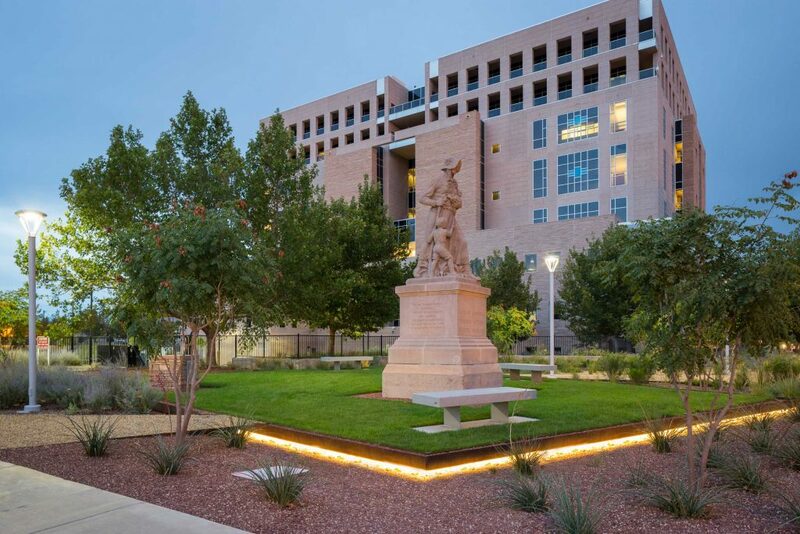 This landscape retrofit drew on the site’s cultural and ecological history to transform the courthouse landscape into a model of sustainable design in an urban arid context. 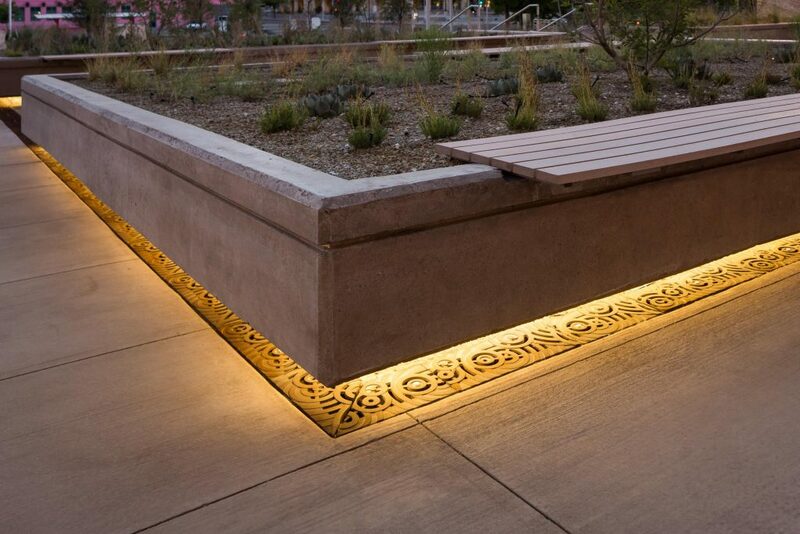 Landscape geometries derived from abstractions of Pueblo patterning result in diagonal topographic features that create a bold, culturally-based identity for the courthouse and refer to the function of the site’s historic Acequia, or irrigation canal. Decomposed granite pathways connect users to the entire site, and seating options provide a range of gathering spaces to support interactions at multiple scales. A regionally appropriate plant palette comprised of over 79% native plants was selected and located according to water-needs, reflecting the surrounding Rio Grande Floodplain Bosque ecology, and providing needed urban habitat. 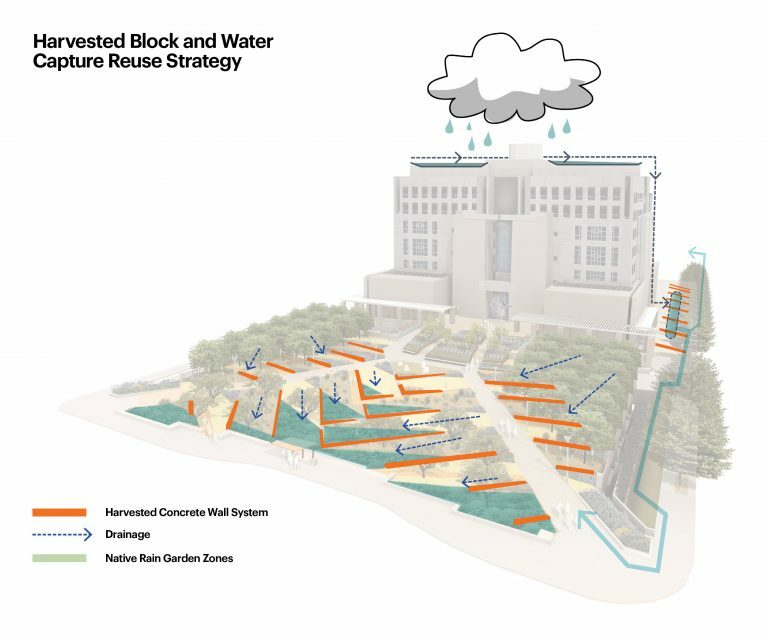 Selective demolition and reuse of 21,000 sf of existing concrete paving generated 10,000 concrete blocks used for garden walls throughout the site; these walls provide seating and create sloped terraces that direct storm water into a system of wet and dry rain gardens, while providing the structural framework of the acequia pattern. This material harvesting strategy helped divert over 460 tons of waste, and increased site permeability by 120%. 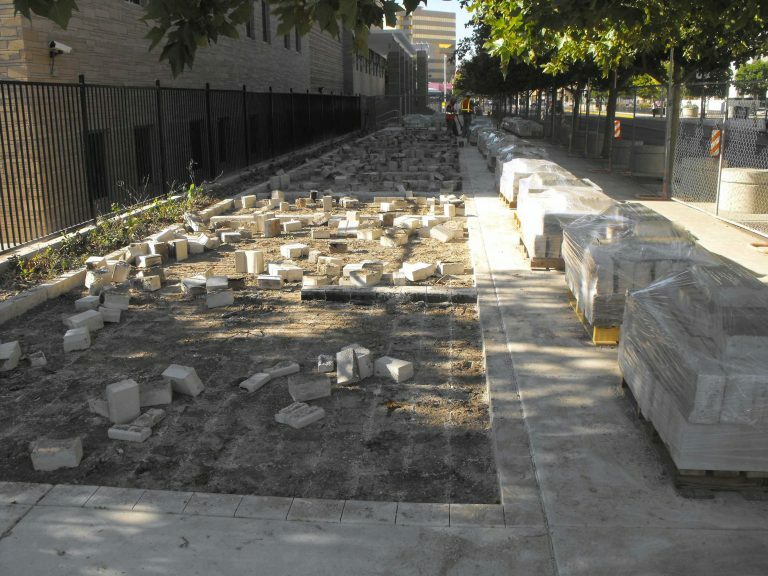 Through the reduction of this hardscape, coupled with the retention of many existing trees and use of light-colored materials, the urban heat island effect was reduced by 74%. The replacement of high-efficiency LED lighting reduced energy use by 30%, and the installation of new 27.5 Kwh solar array offset 99% of outdoor electricity use. 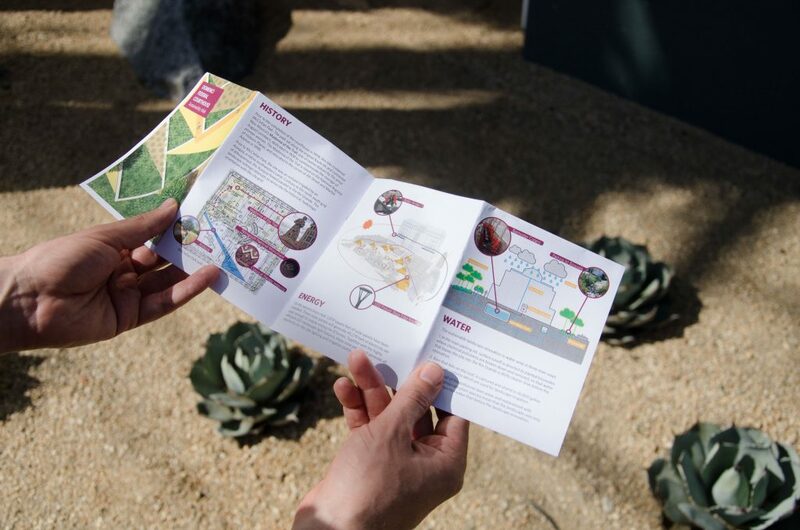 Interpretative signage including a rain water cistern level-indicator and a sustainability walk brochure describe the design features to the site users and public. 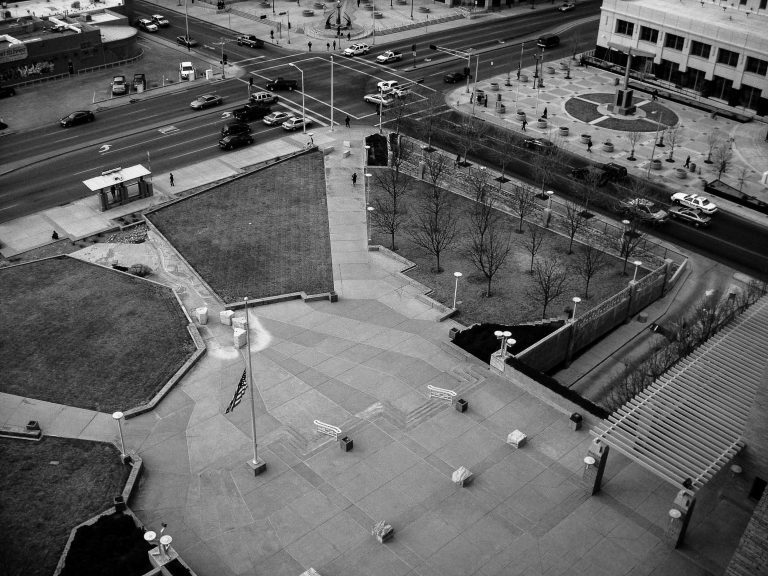 Connecting to the site’s history as McClellan Park, the new plaza design resituates the courthouse back into a park-like setting, providing improved site access, enhanced public amenities, and educational outreach to promote a better courthouse experience. To ensure the long-term health and viability of the site, a detailed Maintenance Plan including native plant trimming diagrams and integrated pest and insave species management were included within the contract documents. 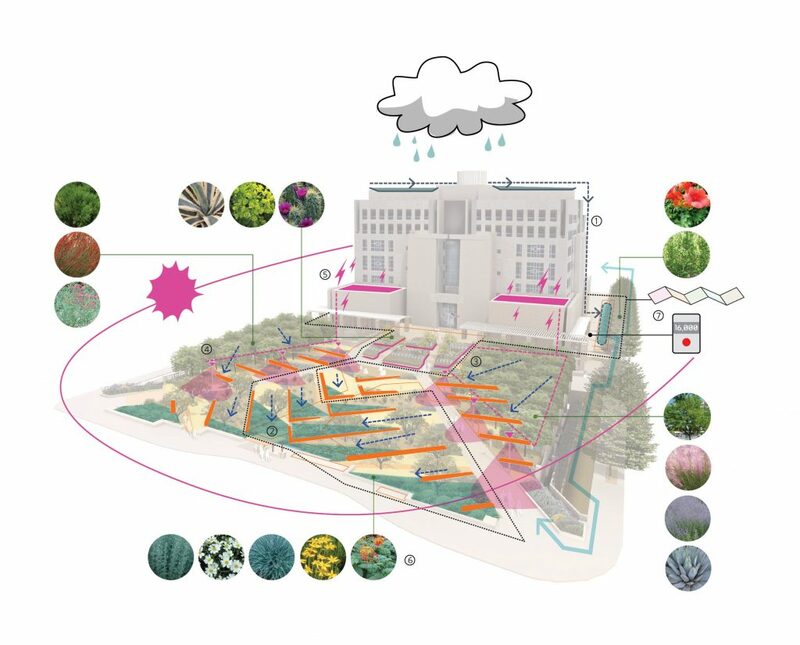 The design’s creative re-use of materials, comprehensive water management program, and adoption of solar power demonstrates how any site can be reimagined to more efficiently use public and natural resources and to reflect our collective values. The result fulfilled the client’s desire for seamless site security, greatly improved site efficiency and economic viability and creation of a park-like setting connecting the landscape back into the community. Following the Two-Star SITES Certification of this project, GSA has adopted the SITES certification standard across its capital construction program. 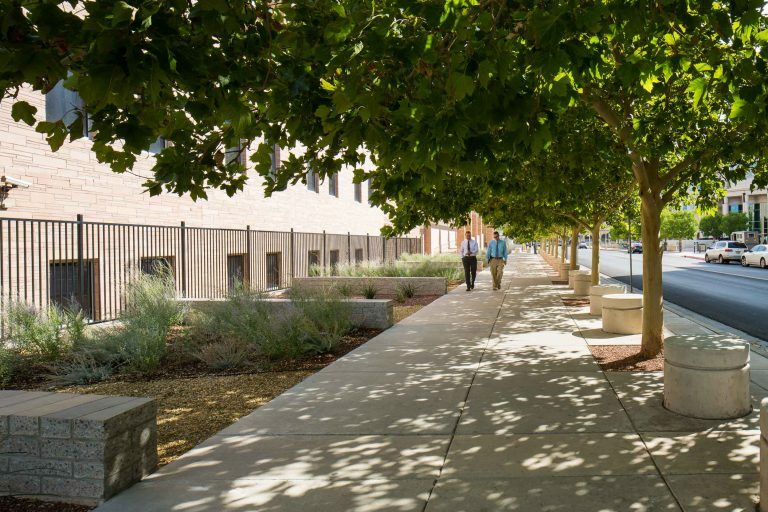 The project transformed a languishing site into a highly performing Federal campus that has become a new icon in downtown Albuquerque and a model for sustainable development.